Log in to https://blogs.miamioh.edu/wp-admin. Select the site that you want to edit by hovering over the “My Sites” menu at the top left corner of your screen. Click Appearance. Additional menu options appear. Adjust settings as needed. Click Save Changes to apply settings. Themes: A theme establishes a common look and feel for WordPress sites without modifying the underlying software. Several themes are available for your use, including a Miami theme. Click Preview to review any theme. Click Activate to apply a theme to your site. You can use any theme available but make sure you include the Miami logo on your blog and it is recommended to use Miami branded colors. Note: You may need to request access to Photoshelter before you can download a logo. Widgets: A widget allows you to place independent sections of content into any widgetized sidebar provided by your theme. The Available Widgets section contains all the widgets you can choose from. Drag and drop the widget title bars into the desired area. Menus: If your theme supports customized menus, you may access this option. Menus may contain links to pages, categories, custom links or other content types. 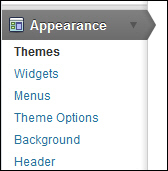 Theme Options: Some themes provide customization options that are grouped together on a Theme Options screen. If you change themes, options may change or disappear, as they are theme-specific. Background: If allowed by your current theme, you can customize the background of your theme by uploading an image or selecting a color to represent the background. Header: If allowed by your current theme, you can customize the header of your theme by uploading and configuring an image. Also, some themes come with additional header images bundled. If you see multiple images displayed, select the one you’d like and click Save Changes.